So much yarn, so little time. : Yarnbombing - heard of it? 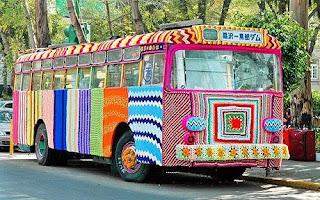 According to the article...Hundreds of knitters around the world have begun wrapping their huge woolly creations around public property like trees, street signs and lampposts. They then take photos of their colourful "art" and post them on internet sites for fellow knitters to view and comment on. One of the most ambitious pieces of work saw a woman spend an entire week covering a disused single decker bus in colourful swatches. That's amazing. I'd buy that bus! lol So colorful. I'v never heard of that before. That bus looks good enough to eat! What a brilliant thing, I really hope it catches on here. I hadn't seen the Telegraph but have heard of Yarnbombing. Only last week I picked up a copy of the Rochdale Art Gallery (Touchstones) brochure for spring and they have yarnbombing going on there. www.artyarn.blogspot.com has some info on it to. What a creative idea to do with excess yarn. My wiener dog says as long as wiener dogs are going to be on anyones yarnbombing hit list. She is good with it. I should think there are quite a few pets who'd be eager to help, not to mention small children! OK so with 4mm needles cast on how many stitches? That's beautiful! I'm glad it's hitting Britain, it'd certainly cheer me up on a dark, wet and windy day! This bus is amazing! I totally want to do this to our car!